What’s so unique about Amazon? Importantly, people usually come to Amazon with a specific product in mind – making it a valuable opportunity to expose your product to customers with a high purchase intent (meanwhile, shoppers tend to use Google to search for products when they’re in the research phase of their purchase journey). In fact, 55% of customers make their first product search on Amazon, and nine out of ten consumers use the platform to price-check products, even if they have found them on another site. 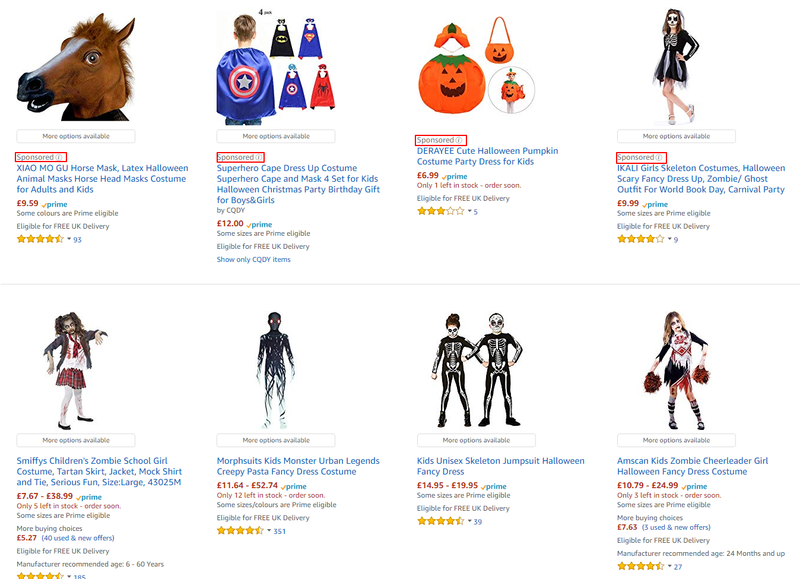 Another unique competitive advantage of Amazon is the detailed customer purchase data that sellers can use to leverage their campaigns: Amazon knows the specific products that customers are purchasing, and how frequently they are purchasing. So it’s easy to see why Amazon is so popular with advertisers: research by Third Door Media (publisher of Marketing Land, Search Engine Land and MarTech Today) found that 80% of advertisers plan to increase their ad budgets on the platform in 2019, with many shifting budget there from traditional search and paid social media advertising. If you sell on the platform, advertising on Amazon is an easy way for you to promote your listings, making them visible to a new audience and helping you maximise sales. Amazon offers a range of options to, including Sponsored Products, Sponsored Brands, Stores, display ads, videos ads, and ads run through the Amazon DSP. Similarly to Sponsored Products, these are self-serve solutions available to registered sellers, vendors, book vendors, Kindle Direct Publishing (KDP) authors, app developers, and agencies. These are managed via an Amazon Advertising consultant. How do Sponsored Products work? Sponsored products is a bottom-of-the-funnel direct response advertising product that drives traffic to Amazon product pages, which offers a valuable opportunity to brands and sellers that want exposure to shoppers with strong purchase intent (as customers generally come to Amazon with the intention of making a purchase). Like Google Ads, Sponsored Products is cost-per-click (CPC) and keyword driven. Keyword-targeted advertising matches the keywords that feature in your campaign to the search terms that shoppers use to search for products on Amazon. When a shopper searches for the keywords in your campaign, your ad has a chance of displaying if it meets the required eligibility criteria. There’s a significant difference in how Amazon ranks ads (ie, decides when and where to show them) compared with Google Ads because Amazon primarily makes money when items are sold; Google primarily makes money when ads are clicked on. In a nutshell, Amazon ranks profitable ads higher; it prioritises what the customer is most likely to buy from based on performance and relevance metrics. The bottom line is that if you optimise your product pages, your Amazon ads will perform better. Product pages are important to ad rank because they influence conversions and overall sales. First thing first. To advertise, you must have an active professional seller account, be able to ship to all UK addresses, and have products in one or more of the eligible categories. Your products must also be eligible for the Buy Box. This is the box on a product detail page where customers begin the purchase process by adding items to their shopping carts. 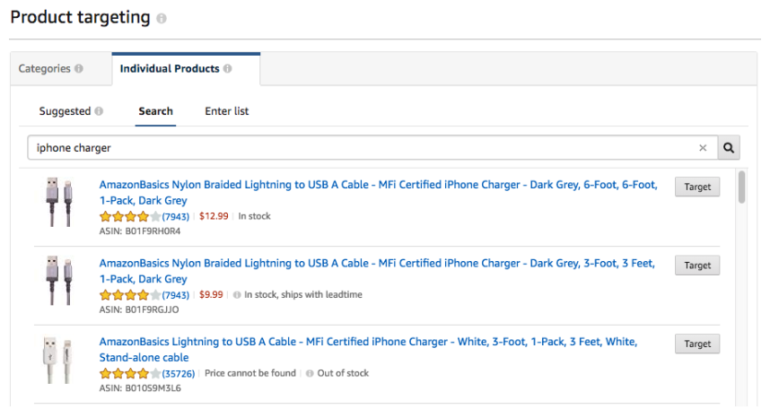 A key feature of the Amazon website is that multiple sellers can offer the same product, so you may compete with other merchants to appear in the Buy Box. Amazon uses performance-based criteria to determine your Buy Box eligibility and placement status. How can I become eligible for the Buy Box? If you’re a Fulfilment by Amazon (FBA) seller, you’re automatically eligible to win the Buy Box. If you’re not, you must meet all of the conditions listed below – but even then, Amazon does not guarantee placement in the Buy Box. Visit Business Reports, then under the section labelled ‘By ASIN’, click on ‘Detail Page Sales and Traffic by Child Item’. Here, you can sort by ‘Buy Box Percentage’ to find your best-performing products. If you have identified products that are winning the Buy Box at a rate of over 90%, Amazon recommends that you start advertising them. You must have a professional account. Your order defect rate, cancellation rate, and late dispatch rate are metrics that determine eligibility — the better you perform, the higher your chances are of becoming buy box eligible. You can see how you’re doing on the account health page. In order for Amazon to accurately assess your performance, it requires that you have sufficient order volume (this varies among categories). Amazon advertising doesn’t allow you to advertise adult products, used products, refurbished products, and products in closed categories. Keyword targeting allows you to choose keywords (including phrases) for which your ads will be shown in customer searches and detail pages. Make sure that your keywords reference those used on the corresponding product detail pages for the best chances of your ad being shown (and of users converting after clicking on your ad). For example, Amazon will not show an ad for the keyword ‘coffee table’ if the campaign only contains dining table products. According to Amazon, sellers who update their keywords at least three times during the first 60 days of advertising have up to 100% more ad attributed sales. You can provide your own the keywords, or let Amazon find the keywords for you automatically. 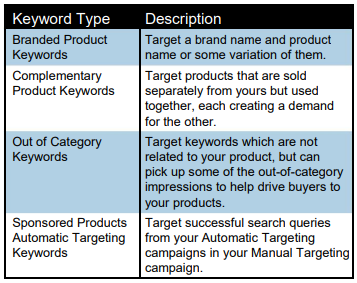 There are two ways to build and manage campaigns with Amazon Sponsored Products: automatic and manual targeting and which will affect your keyword strategy. 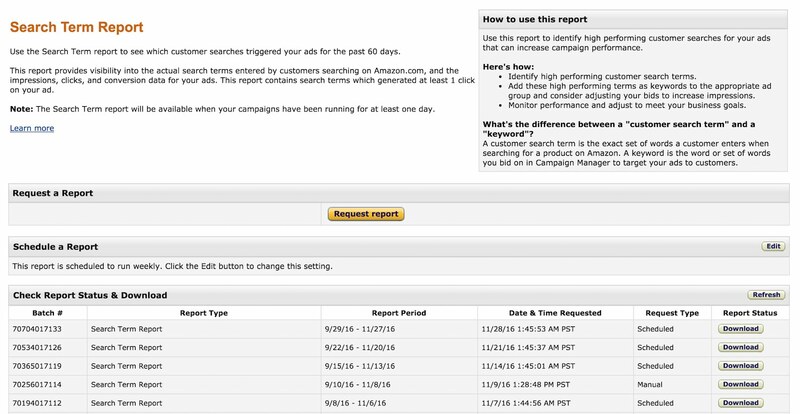 Amazon targets ads to all relevant customer searches based on product information. This ensures you cover a wide variety of search terms and save you time by not having to manually generate keywords, as Amazon will do the work for you. How do you identify which keywords you should be targeting? If you’re just starting out, try using Google Keyword Planner to research and identify keywords for product listings and their descriptions. This allows you to identify high-performing search terms to add to the appropriate ad group and consider adjusting your bids to increase impressions. You can also use these terms as part of your organic Amazon strategy to optimise your titles, descriptions, and marketing bullets so that your Amazon listings are optimised for what people are actually searching for. Get even more granular by build your campaign structure with only one SKU (stock keeping unit) per ad group. This allows you to attribute performance of the term directly to the SKU purchased or clicked on and accordingly adjust your bidding strategy. This match type offers your ad broad traffic exposure. A customer search term will match if it contains all the keyword terms or close variants (plural forms, acronyms, abbreviations, and accents). The customer search term can contain keywords in any order. The customer search term must contain the exact phrase or sequence of words or their variations. It is more restrictive than broad match, targets more specific audiences, and will generally result in more relevant placements for an ad. The customer’s search term must match exactly the keyword in order for the ad to show, or close variations of the exact term. Exact match is the most restrictive match type, but can be more relevant to a customer’s search. The user interface is intuitive, and you set up a campaign in a similar way you would in Google Ads (formerly Google AdWords). However, the creative for your campaign is automatically generated through the ad builder; you can customise the headline and logo before you submit the ad. If you’re an experienced Google Ads advertiser, setting up a campaign is something you’ve probably already mastered, and you can transfer those skills to structure your campaigns and ad groups with Amazon’s ad platform. If you’re new to Sponsored Products, it’s probably best to begin with Automatic Campaigns, where Amazon will target your ads to all relevant customer searches based on your product information. You can select the products you want to promote, or include all of your products. The advantage with the latter option is that it will make it easier to identify which terms customers and potential customers are using to find your products. Each product you select to advertise using Sponsored Products will be automatically formatted as an ad, ready to go live in minutes. Each ad can be organised into ‘ad groups’, which is a collection of products you have selected to advertise, based on common characteristics such as product type or price. The product that wins an ad placement will be the one most relevant to the words a shopper types into the Amazon search bar. According to Amazon, on average, sellers who selected at least two ASINs (Amazon Standard Identification Number – a ten-character alphanumeric unique identifier that’s assigned by Amazon) to advertise have up to: 40% more clicks, compared to those who advertised one ASIN during the first 60 days of advertising with Sponsored Products. Set your daily budget to at least £5. A campaign’s daily budget is the maximum amount you’re willing to spend on advertising per day. You can change your budget at any time. If your ad campaign runs out of budget, it will stop showing. If your products are popular, you may find that you need to further increase your budget. If you see that one of your products is appearing in search results and driving sales, we recommend you keep it live; if you see the product is resulting in a high number of clicks but a low number of sales, swap it for a different product, or separate it into a separate ad group with more specific keywords. Amazon recommends adding at least five keywords to your campaign to begin with. Add negative keywords to Sponsored Products ads to cut out irrelevant and ambiguous phrases and prevent your ads from appearing on search results or detail pages that don’t meet your performance goals and waste your budget. If you’re using automatic targeting, Amazon will bid on your behalf. If you’re using a manual campaign, decide how much you’re willing to spend per day over a calendar month – your average daily budget. For example, if you set your average daily budget to £100, you may receive up to £3,100 worth of clicks in that calendar month (assuming a full 31-day month). Ad spend on any given day may exceed your average daily budget but, at the end of the month, the average daily spend won’t exceed your average daily budget. Generally, we recommend creating campaigns with no end date so that you can run a campaign indefinitely. You can pause a campaign at any time. The minimum duration for a campaign is one day. The Fixed Bids option means Amazon uses your exact bid and any manual adjustments you set. This is the best choice if you have very specific CPCs in mind for your products. ‘Down-Only’ is the default option, and means that Amazon lowers your bids in real time if your ad is less likely to convert a sale, making it best for newbies or those on a limited budget. With ‘Up and Down Bidding’, Amazon raises your bids by a maximum of 100% if you are likely to convert a sale and lowers your bids when you are less likely to make a sale. You can set bids at the ad group or keyword level. These help your ads show when you want them to. There are two placement modifier options: ‘Top of Search’ and ‘Product Pages’. You can set the option to increase your bids by up to 900% to ensure placement for both options. The ‘Top of Search’ modifier lets you increase your bid to help your ad stay top of page. The higher the percentage, the more likely your ad stays top of page. However, this also means you’ll probably pay more for your each click. A £1 bid set with a 900% modifier could cost you up to £9 if someone clicked your top of page ad. The ‘Product Pages’ modifier lets you set how much you are willing to increase your bid to be shown on product pages, where customers view individual products (the ad shows below the Buy Box). Unsure whether to use keyword targeting or product targeting? A keyword targeting strategy is the best option when you know the search terms that shoppers use to search products like yours. For example, if your ad product is ‘blue ladies dress’, you may choose the keyword “blue ladies dress.” When a shopper searches for a product with the search term “blue ladies dress” your ad is eligible to show in search results and detail pages. Use product targeting to outsmart competitors. You can find competitor products that have poor reviews and ratings, target those specific ASINs, and then advertise your best products against their poor performers. Combine this method of targeting with a high product pages placement modifier and you have a campaign that is all but guaranteed to show on competitor product pages. Loose match/Close match. This allows your ad to be shown in the search results if your ad product closely or loosely matches searches results from shoppers. Substitutes/Complements. This shows your ad on the detail pages of products that are substitutes or complements of your ad products. Use both automatic and manual targeting to complement one another, ie, create a manual targeting campaign, optimising the bids accordingly based on performance. Then create an automatic targeting campaign as a “catch all”. Set the bids lower and use the campaign as keyword research. Then when a search term begins to perform well, introduce that as a keyword in the manual targeting campaigns. Take an ‘always-on’ approach. Amazon recommends continuously running campaigns to keep your products top of mind for shoppers. Amazon provides detailed metrics through a range of tools and reports to help you to analyse campaign performance, measure success and refine your ads. Once you have launched your campaign, you can view all reports on the reporting page. Available metrics to measure campaign performance include clicks, spend, sales and ACoS (Advertising Cost of Sales – calculated by dividing the total cost of advertising by sales generated), and reports which you can download on a regular basis to keep track of performance. To see you the number of times your product appears on a page or is bought as a result of your ads, visit the Advertising Report after your ad campaigns go live. Anyone who has ever bought or sold products online knows that Amazon is the place to be and, if you sell on the platform, advertising on Amazon is an easy way for you to promote your listings. Ads appear right where customers will see them, such as the first page of search results or product detail pages. These targeted ads can bring your products to a new audience and help you maximise your sales. However, like any other ad campaign, continuous review and strategic optimisation is crucial to success. Look out for our forthcoming Amazon eBook series, which will explore, step-by-step, how to set up and optimise each type of Amazon advertising campaign. In the meantime, check out our other SEO, PPC, social media and content marketing eBooks, cheat sheets, infographics, toolkits and boxsets.